Gas Girls, was created to commemorate the centenary of World War I in 2014. 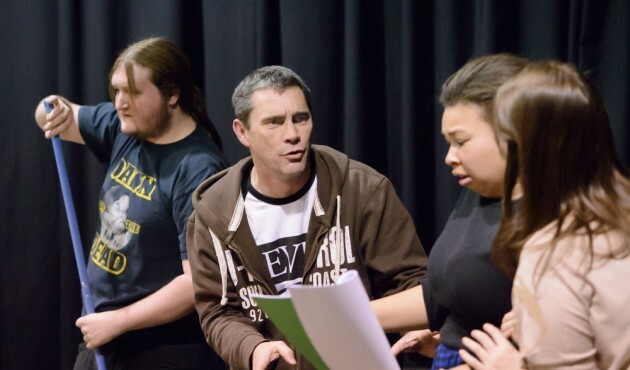 The show was devised & performed by a cast of 20 local people, previewed at the acta centre in March, and toured to Bristol communities in June. It was fantastic, such an incredible story, and performed with sensitivity and an enthusiastic talented cast. Wonderfully produced & staged, as well as telling a terrible, touching & affecting story. The whole play was captivating. Photographs from the show are available to view here. The Gas Girls book was launched at the preview performances in March, and sold throughout the tour (Avonmouth – University of Bristol – Withywood – Horfield.) A few copies remain, and are available online or from the acta office, priced at £5. There is also an exhibition available. The Gas Girls blog, updated throughout the project (see below), tells some of the stories from the research and the discoveries that went into creating the book and the touring show. The show was watched by nearly 1,000 people, two thirds of whom were not regular theatre-goers. As well as offering a new piece of community theatre to our established audience in Bristol, it successfully engaged a new audience to acta; for two thirds of the audience it was their first ever acta show. 1 in 5 audience members lived in the local community. 2 in 5 audience members lived in a neighbouring community. Wonderful show, but quite horrific. Surprised it went on so close to home. A fantastic portrayal of a real life story. Very powerful, the more so because it was true. The project was supported by lottery funding from Arts Council England and Heritage Lottery Fund. Our visit to the National Archives last week was really successful, and it was amazing to be given access to original documents. We had little idea of what we would find out – from the ‘Discovery’ catalogue the NA publishes online, you get only a few words which describe the different documents. As we are looking for any information on the two factories – HM Factory Avonmouth (which produced the Mustard Gas) and National Filling Factory No 23 (which filled shells with the gas) – we did searches on those two areas. But until the actual files arrived on our desks, we couldn’t be sure exactly what we were getting, or how relevant it would be. Well, there was a lot of it, and it was all very relevant. We spent most of our time there skimming through the huge files, identifying what looked interesting and relevant to our project, and copying it, on our phones, on the massive NA photcopier! or scanning documents and e-mailing them to ourselves to be looked at later. Four hours of frenzied research! So, today we met again, and began sifting through the information we had found at the National Archives last week. It includes: letters to and from the Ministry of Munitions about the setting up of both factories; medical reports on both factories; scientific material on the production of the gas, and the effects of gas on the human body; histories of both factories; compensation claims for injuries and death. The process is fascinating and horrifying in equal measure. More in the next blog about what those casualties actually were, and how they were caused! One of our initial prime sources for information on the mustard gas factories, is a medical report written by Captain Harry Roberts, who was the medical officer for both the HM Factory, Avonmouth (where they made the gas) and (for a while at least) the National Filling Factory at Chittening. In a fairly cool report written in December 1918, Captain Roberts lists the diseases caused by the gas. Physical contact caused blisters over all of the body, the gas seeping through all clothing, protective or otherwise. Inhalation caused bronchitis, trachieitis, gastritis, bronco-pneumonia. Conjunctivitis was common for all workers. In the 6 months of operation, there were 1,100 people employed at Avonmouth factory. 710 of these were affected by Mustard gas poisoning, some of them with several distinct illnesses. Altogether there were 1,400 illnesses, including fatal cases. The total attendances at the factory hospital was 5,600 – so an average of 40-50 cases per day!!! That of course, is just the plant where the Mustard gas was made. At the Filling Factory, it is clear that things were just as bad, if not worse, with all workers taking the most horrifying risks with a lethal chemical mix, in a factory where mustard gas was leaking from every pipe, and accidents were a daily occurrence. There were a reported 1213 casualties at the Chittening Filling Factory between August 15th 1918 (when the first Mustard gas arrived from HM Factory Avonmouth) and the end of the war on November 11th. The reference is in a book called The Poisonous Cloud by L F Haber, but we’re trying to track down where he got his information from. It’s not surprising; according to a report written in 1919 by Lieut. Vernon, the complete lack of health and safety in the factory caused multiple casualties; on one occasion every single person on shift was gassed, and had to be sent home to convalesce. At first, the gas (which of course was actually a liquid) arrived in barrels, which had to be rolled up a steep slope into the roof of each ‘charging shed’. Here it was poured into a large tank, from where it was fed by gravity through pipes into the charging machines, operated by the girls. It was near impossible to fill a shell without getting the mustard gas all over it (and themselves). The mustard gas was like oil, it seeped and leaked from every joint, every pipe every machine. It collected in puddles on the floor, they put out old tins to catch the drips from the pipes in the ceiling. A large, lead-lined drip tray sat beneath the tanks in the roof, to collect spillages. Each charging shed had buckets of old rags, with which they wiped up any spillage, and these rags contributed to the cloud of poisonous vapour that lingered in every shed. When they finally put in fans strong enough to dispel some of this vapour, it just pushed it outside, between the huts, where hung in the air, affecting the men working outside, eventually finding its way back inside. Researching today at the Bristol Records Office, Karen found two original maps of the Chittening factory, one showing the area with a sketched idea of how the factory would be positioned, and the other with a scale diagram showing all the buildings planned. We’re starting to think that the factory was never completed, but are looking for firm evidence of this. Karen also had a bit of a shock, when she realised that she now lives just a quarter of a mile from the old factory site!! At the Bristol Records Office today our star researcher Karen also found a really interesting article about Avonmouth and Chittening factory written by David Caldwell-Evans for the Bristol Times 1998. We are hoping if we can track down the writer he might know more information about these factories that he can share with us. The hunt is on! In at Radio Bristol this morning at 7.30, putting out a call for any stories people may have heard from older relatives about the Mustard gas factories. Ingrid Jones (acta’s Associate Director) lived in Henbury, close to the Chittening site, as a child, and remembers being told by her mother not to play near there, because ‘the ground is bad’. She also remembers adults muttering quietly about the ‘bad factory’, and ‘they buried it there’. Fascinating folk memories, just the sort of material we’re trying to uncover. By this time Captain Harry Roberts was supervising medical work at both Avonmouth and Chittening, but this was only seen as a short term measure. We’re still trying to uncover what happened after this – we’re convinced that somewhere there is a medical record with the full details. Captain Roberts’ report on HM Factory Avonmouth continues to throw up interesting facts – among these is the treatments for some of the diseases caused by exposure to HS (Hun Stuff) as they called Mustard Gas. In the event of inhalation of the gas, patients were sprayed in the throat by a mixture of oil of eucalyptus, menthol, iodised phenol, Tarebene, and saxol (ferris). Then comes the most interesting part: ‘The elixier of acetomorphine was found to be very serviceable in allaying cough which was paroxysmal’..
Acetomorphine, when we looked into it, is better known today as Heroin!! So our Gas Girls (and boys) were being treated with heroin for their coughs. The severe conjunctivitis, by contrast, was treated with eyedrops of warm paraffin and cocaine! Recently discovered among our National archives finds an updated report by Captain Roberts written in January 1919 (two months after his former report). This new report mentions the Chittening factory, and the conditions there. We’re still trying to find more information about women who worked at Chittening – and recently were contacted by a grand-daughter of one of the women, who was awarded a medal, possibly an OBE, for her work there! We are searching hard for records of awards and honours given to munitions workers after the war. It seems that lots of workers were given badges to confirm their war worker status, and there is also a list of women given honours after the war – so we’re still looking! We did find that James Robert Craig, the managing director of the HM Factory Avonmouth – was given the CBE in 1920 in recognition of his work there. The Gas Girls script was completed in December, and rehearsals began last night. Research has been gathered both for the play, but also for the book, exhibition and film that will accompany the play when it tours later this year. Prior to this there will be a run of performances at the actacentre from 19th-21st March. We are still looking for any memories, photos or general information about the Mustard Gas factories – so please contact us if anything has come to light. I’ve just heard that we have sold all but 6 tickets for the preview performances in March. ‘Gas Girls’ seems to have really captured the imagination of the people of Bristol. Fir Sukor liked this on Facebook. Rita Rich liked this on Facebook. all at acta very proud of the show, and looking forward to the tour later this year – tickets are already selling for each performance. Information is still trickling in – a woman from Avonmouth came to see the show on Frioday, and afterwards told me a story of a relative of hers who had worked on the Chittening site after the war. They had been told that after the First World War, ‘they dug a great big hole on the site, and everything went in it, all the shells, barrels, machinery, everything from the factory, then they filled it all in. They said that nothing could be built there for a hundred years. But there’s a big warehouse there now, right on top of it’. If the book continues to sell as well as it did last week, we will be able to put new facts and stories into the second edition -= in the meantime, keep your eyes on this blog, as I’ll be keeping it updated with new information as it comes in. After a short break, activity on Gas Girls recommences – Exhibition boards for the tour are looking wonderful; tickets for tour performances are selling well, and tonight the cast get back together to begin the re-rehearsal process. Interest in the project continues to be high, with English Heritage requesting Gas Girls books for their archive. Rebecca Davidson liked this on Facebook.